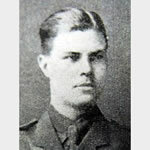 On 28/29 April 1917 near Gavrelle, France, when British troops were holding a salient which was being repeatedly counter-attacked by German forces, Second Lieutenant Haine organised and led six bombing attacks against a German strong point and captured the position, together with 50 prisoners and two machine-guns. The enemy at once counter-attacked and regained the lost ground, but Second Lieutenant Haine formed a "block" in his trench and for the whole of the following night maintained his position. Next morning he again attacked and recaptured the position. His splendid example inspired his men during more than 30 hours of continuous fighting.